God’s Masterpiece | God's Abundant Blessings! 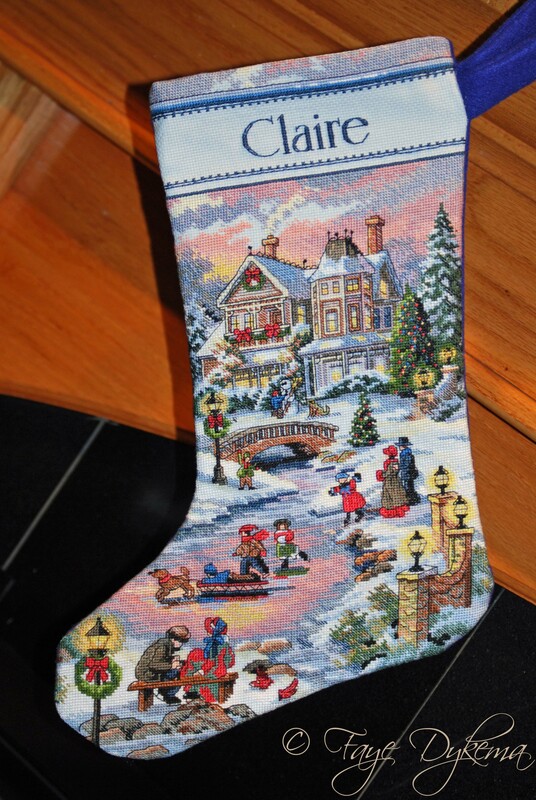 I enjoy cross-stitching and felt the need to take on two very time-consuming Christmas stockings out of love for my precious granddaughters. I finished one in 2010 for the youngest who lives in the same town with us. But then knowing the time it took to prepare the first , I had a hard time beginning the next. It sat in the drawer for over a year. I came up with several excuses – lighting, dry eyes, sore hands, etc. But not having both stockings to hang this year bothered me, so I recently took the other one out to work on for Christmas 2012. Looking at it, most people see a very beautiful work of art. But I can focus on the mistakes so quickly. I can see where I miscounted, where my stitches go in the wrong direction, where the bridge has extra stitches or the house isn’t perfectly symmetrical. But my granddaughter just sees the snowman, birds, kids playing and the doggy, and of course, the presents inside ;-). God doesn’t say you are an imperfect work of art. He calls us masterpieces. Masterpieces are priceless. We need to see ourselves as God sees us. I am not comparing myself to God, but I’m thinking as the creator of these stockings of the time, dedication, poked fingers, frustration at thread not cooperating, and other things and yet there is pride in the beauty of the work once it is done because it was prepared in love for the girls I love. God is the Creator of each one of us. He knows we are imperfect. He knows we have blemishes, flaws, and we make mistakes. Even when we intentionally turn our backs on Him or don’t listen to Him, He loves us unconditionally. or anyone could recognize your face. secluded in God’s safe and hidden place. He brought the masterpiece into the world. Little Lamb of God, you are a masterpiece. Just how much your life has meant to me. And I’m so proud of you what else is there to say? Just be the masterpiece He created you to be. We are all created as God’s handiwork, His workmanship. If I can take pride in a simple Christmas stocking, how much more does God pleasure in the beauty and individuality He has made in each one of us, His children. Posted on February 6, 2012, in God's Blessings, God's Grace and tagged Ephesians 2:10, fearfully and wonderfully made, God's Handiwork, God's Masterpiece, God's Workmanship. Bookmark the permalink. 2 Comments. What a beautiful gift. I did something similar for my niece 10 years ago and now I have my own grand daughter that I’d like to do one for – and I love this pattern. I know I spent over 1000 hours in my last project, but it’s something I know she’ll cherish in years to come. Can you tell me the name/brand/number of this pattern?